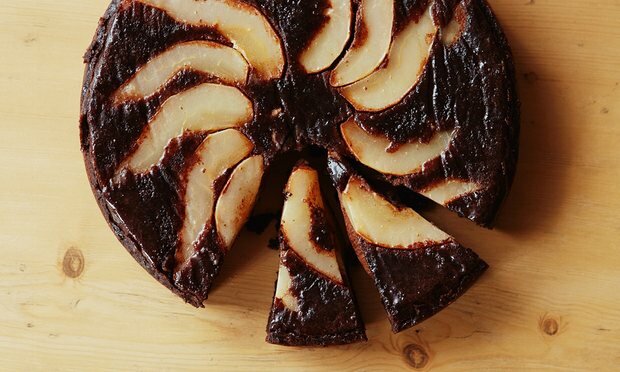 Pale Chocolate basis of crumbly dough with sour cream and cottage cheese and filling with spices and juicy pears … Pie on this recipe turns out a bit like a cheesecake with a touch of spicy in taste. We really like. Try it and you! average egg (weighing about 65 g.) 1 pc. In advance (for 1-2 hours before cooking the pie), remove the butter from the refrigerator, so that it becomes soft, either directly soften before cooking it in the microwave. Turn the oven and preheat to 3 digits (170 ° C). Measure out into separate containers need prescription amount of sugar (adding the vanilla sugar or vanilla) and wheat flour with salt, baking powder and cocoa (by mixing them with a spoon until smooth). Proceed to the preparation of the dough. The large capacity of about 3.5 liters mixes with a mixer with beaters conventional soft butter with sugar and vanilla sugar (or vanilla), then add to it the egg and mix again. Put in a mixture of sour cream, mix and type in two stages (at ⅓ of the entire mixture) flour with baking powder, salt and cocoa, sifting them through a sieve and each time stirring with a mixer until smooth. Then sprinkle in the remaining ⅓ mixture of dry ingredients (as sifting), Ober remains of dough with whisks and kneaded his hands already as long as it will not keep up with them and the walls of utensils. Form a ball of dough. The large aluminum baking tray (21 × 32 cm, height 5 cm, or any other similar areas) Shots (with reserve) non-stick baking paper. Good Punch her hands on the bottom of the pan, then lay the paper on the table and roll it on the dough into a rectangle slightly larger than the bottom of the pan (about 2-2.5 cm) from time to time and even trim seam hands. Transfer the dough with parchment back in the pan and put it in the fridge, no closing, for 15-20 minutes. At this time, prepare fill. For this purpose, a high capacity of about 3.5 liters, mix until smooth with the usual mixer beaters need a prescription amount of cottage cheese, sour cream, sugar, lemon juice, starch, eggs and spices. Turn the mixer on low speed at first (to avoid splashing ingredients), and then increase it. Remove the pan with the dough from the refrigerator and pour it into the prepared p. 6 Fill if desired (to less dough soaked in baking) pre-sprinkled surface layer 1 tbsp. l. without slides starch and spread his hands. Gently shake the pan from side to side to fill flowed across the surface of the formation, but not poured out for bumpers. Pears Wash, peel and seeds and cut into slices of medium thickness. Put the resulting slices, lightly pushing it in the fill at an equal distance from each other. Put the cake in the oven and bake at number 3 (170 ° C) for about 45 minutes or as recommended in the instructions to your oven for baking pastry. We finished the pie filling surface must “grab” and have golden-glossy surface. Ready pie, remove from oven and cool completely in the form, and then serve immediately, cutting into portions pieces with a sharp knife, preferably each time making it in one motion to look neat slices. The remains of the cake store up to 1-2 days, always in the refrigerator at a temperature of + 5-6 ° C in the same pan in which it is baked, it is further wrapped in plastic polyethylene film or removing a clean plastic bag or expanding portioned pieces of cake on a small individual plastic bags. If you want to test the layers and filling in the finished cake were thicker, use a smaller form than specified in the recipe, for example, a small aluminum pan (size 17,5 × 27,5 cm, height 4 cm.). But I still prefer the proposed option below.